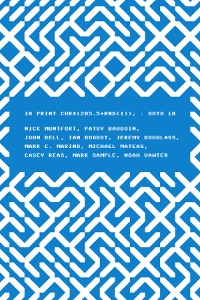 I’m delighted to announce the publication of10 PRINT CHR$(205.5+RND(1)); : GOTO 10 (MIT Press, 2013). My co-authors are Nick Montfort (who conceived the project), Patsy Baudoin, John Bell, Ian Bogost, Jeremy Douglass, Mark Marino, Michael Mateas, Casey Reas, and Noah Vawter. Published in MIT Press’s Software Studies series, 10 PRINT is about a single line of code that generates a continuously scrolling random maze on the Commodore 64. 10 PRINT is aimed at people who want to better understand the cultural resonance of code. But it’s also about aesthetics, hardware, typography, randomness, and the birth of home computing. 10 PRINT has already attracted attention from Bruce Sterling (who jokes that the title “really rolls off the tongue”), Slate, and Boing Boing. And we want humanists (digital and otherwise) to pay attention to the book as well (after all, five of the co-authors hold Ph.D.’s in literature, not computer science). 10 PRINT was written by ten authors in one voice. That is, it’s not a collection with each chapter written by a different individual. Every page of every chapter was collaboratively produced, a mind-boggling fact to humanists mired in the model of the single-authored manuscript. A few months before I knew I was going to work on 10 PRINT, I speculated that the future of scholarly publishing was going to be loud, crowded, and out of control. My experience with 10 PRINT bore out that theory—though the end product does not reflect the messiness of the writing process itself, which I’ll address in an upcoming post. 10 PRINT is nominally about a single line of code—the eponymous BASIC program for the Commodore 64 that goes 10 PRINT CHR$(205.5+RND(1)); : GOTO 10. But we use that one line of code as both a lens and a mirror to explore so much more. In his generous blurb for10 PRINT, Matt Kirschenbaum quotes William Blake’s line about seeing the world in a grain of sand. This short BASIC program is our grain of sand, and in it we see vast cultural, technological, social, and economic forces at work. 10 PRINT emerges at the same time that the digital humanities appear to be sweeping across colleges and universities, yet it stands in direct opposition to the primacy of “big data” and “distant reading”—two of the dominant features of the digital humanities. 10 PRINT is nothing if not a return to close reading, to small data. Instead of speaking in terms of terabytes and petabytes, we dwell in the realm of single bits. Instead of studying datasets of unimaginable size we circle iteratively around a single line of code, reading it again and again from different perspectives. Even single characters in that line of code—say, the semicolon—become subject to intense scrutiny and yield surprising finds. 10 PRINT practices making in order to theorize being. My co-author Ian Bogost calls it carpentry. I’ve called it deformative humanities. It’s the idea that we make new things in order to understand old things. In the case of 10 PRINT, my co-authors and I have written a number of ports of the original program that run on contemporaries of the C64, like the Atari VCS, the Apple IIe, and the TRS-80 Color Computer. One of the methodological premises of 10 PRINT is that porting—like the act of translation—reveals new facets of the original source. Porting—again, like translation—also makes visible the broader social context of the original. In the upcoming days I’ll be posting more about 10 PRINT, discussing the writing process, the challenges of collaborative authorship, our methodological approaches, and of some of the rich history we uncovered by looking at a single line of code. In the meantime, a gorgeous hardcover edition is available (beautifully designed by my co-author, Casey Reas). Or download a free PDF released under a Creative Commons BY-NC-SA license.